In a Raleigh, North Carolina court room, the racial lines have been drawn; the spectators’ gallery is split by race, which reflects a split between the plaintiff’s table and that of the defendant. They are here to determine the impact industrial hog farming has had Black families who have long owned properties near Murphy-Brown, LLC pig farms. Families are suing the commercial pork producer for being a nuisance detrimental to their communities’ health. In this trial, the second of roughly two dozen scheduled through the year, seven Black families totaling 30 plaintiffs originally sued Murphy-Brown, although because of a court order, that number has been reduced to two. The company owns the 4,740 hogs raised by Joey Carter, a contract grower in Beulaville, in Duplin County. But in addition to his power as a farmer backed by a billion-dollar corporation, Carter has a special status: He served as a Beulaville police officer for 32 years, four of them as chief. The stories told by the plaintiffs about how their lives have changed since Joey Carter established his commercial farm are powerful. Their homes were long established and passed from generation to generation before Carter began raising hogs nearby. Although these are not wealthy Black families, they do own the land they live on. Carter’s commercial farm has changed their lifestyles and damaged their ability to live healthy, safe lives. The issues of race, though, are still lingering in the background and have yet to be delved into during the first week of the trial. Instead, the plaintiffs… are laying a similar foundation to the one that succeeded in the previous case: Prime the jury on the basics of nuisance law. Educate them on the health problems associated with living near industrialized hog farms. Then zero in on the wealth and political power of Murphy-Brown, including the corporate giant’s apparent unwillingness to substantially change its farming methods in the name of profit. […] In court documents, the families allege that stench, insects, buzzards, dust, dead hogs and truck traffic emanating from the confinement buildings, lagoons, sprayfields and farm operations “have substantially and unreasonably interfered with their use and enjoyment” of their property—the cornerstone of nuisance law. Right to Farm laws have passed in every state and favor the commercial, industrial farming operations. North Carolina passed a law in 1979 to protect farmers from neighbors who had “moved to the nuisance.” The plaintiffs in this case, however, have lived on their properties for 40 to 70 years. Joey Carter built his southern farm in 1984, a full 10 years after the last resident/plaintiff moved in, and he added his northern farm (now they are one large complex) in 1995. Clearly the neighbors/plaintiffs preceded the hogs. 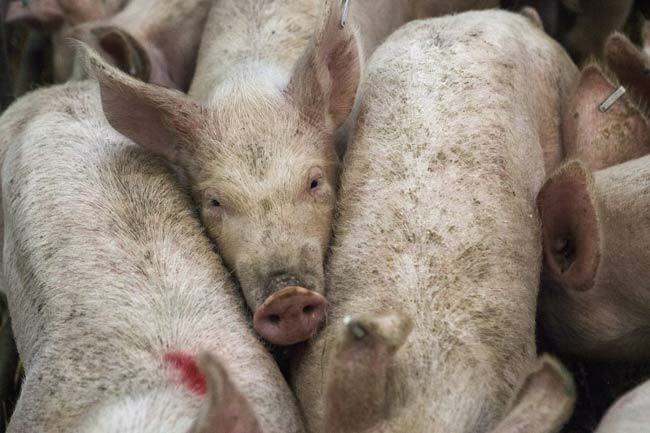 As this trial proceeds, there are other complaints that have been filed with the Department of Environmental Quality in North Carolina that allege environmental racism in the state’s swine-waste permitting. Last January, the EPA’s Civil Rights office stated in a letter to the state agency that it had “deep concern” that African-American, Latino, and American Indian communities were subject to discrimination in the location of waste producing operations. A group of philanthropists gather in the Bay Area to consider what current global crises of inequality and climate change require of the field.